- They use the task system (steps are shown in task window, but steps are only revealed as you get to them). - Scale in difficulty, loot quality, and mob levels (based on your group's highest level player - as low as 85). - Tuned for 2-3 players and their mercenaries. - Nameds can spawn as you progress through the task (you usually have to complete a few steps before this can happen). - Collection items can drop from mobs in the instances, and ground spawns appear midway through tasks. - Expected time of completion will vary by your group's makeup (anywhere from 30-90+ minutes). - There is some variations/randomization in the task steps you'll be assigned as you progress through the task. - We only display task steps we know about. --- If you encounter a step that isn't documented here, please post the details (or email us) and be sure to indicate which step number it was so that we can display it in its proper place. This is a heroic adventure (1-6 players) that begins with Priestess Gli`helin (click for map image) in Degmar. - Say "adventure" to request the task and "ready" to zone in. --- DPS him to 30% to update. --- He's now in the prison area. --- He won't get away this time. At this point in the task, collectibles spawn in the zone (ground spawns) and a named (or its PH) has a chance to spawn. --- Loot "Doll of Tunare" from Sergeant Knotlest Degmar's corpse. --- She'll be most appreciative. "Ghostly Guard" (or its PH "a haunted Degmar guardian") spawns on the bottom floor of the safe room (locked area of the zone) after the seventh step is completed. You have been assigned the task 'Castle Relic'. Priestess Glihelin would like you to retrieve her relic. It is in possession of the Sergeant, who is locked in the safe room. Commander Alast Degmar has a key. Task Window Says: The design of the castle is odd. You will need to go through the library to get to Commander Degmar. If You Get This Step: Explore update in the library around /loc -280, -190, -25. Task Window Says: Though they are a bit myopic, and mostly care about their books, the librarians are a bit zealous. Go ahead and destroy some of them so more people will be able to enjoy books. If You Get This Step: Kill update. Task Window Says: The diggers are crazy. They may eventually dig far enough to damage the magic keeping this keep safe. Kill them before they kill us all. Task Window Says: You can reach the throne room through the south exit of the library. If You Get This Step: Location update. Task Window Says: Commander Alast Degmar has the key to the safe room. Retrieve the key from him any way you can. Task Window Says: The commander has run away! Follow him. If You Get This Step: Location update in the prison to the west, then south - at about /loc -490, 80, -25. Task Window Says: The prison guards are going to protect the commander. Reduce their numbers. Task Window Says: The prisoners have escaped. They are all violent offenders. Kill them to keep them from killing everyone in the keep! Task Window Says: Commander Degmar is trapped. Retrieve the key from him any way you can. If You Get This Step: Kill & Loot update. As of a January 2015 patch, you should receive credit for the 'key' as long as you're part of the task and regardless of whether or not you're on his hate list or even in the zone. Commander Alast Degmar has been slain by _____! Commander Alast Degmar's corpse falls. You pick up a key you see drop from the Commander's body. Task Window Says: The relic will be in the safe room. Make your way there. If You Get This Step: The entrance to the safe room is south of Priestess Glihelin, just north of the dining hall where the spectral revelers are in the non-instanced zone. Location update at about /loc -380, -60, -10. Task Window Says: You will need to eliminate some of the guards, or they will kill you before you can leave with the relic. Task Window Says: The sergeant has the relic. You need to kill her and take it from her corpse to retrieve it. 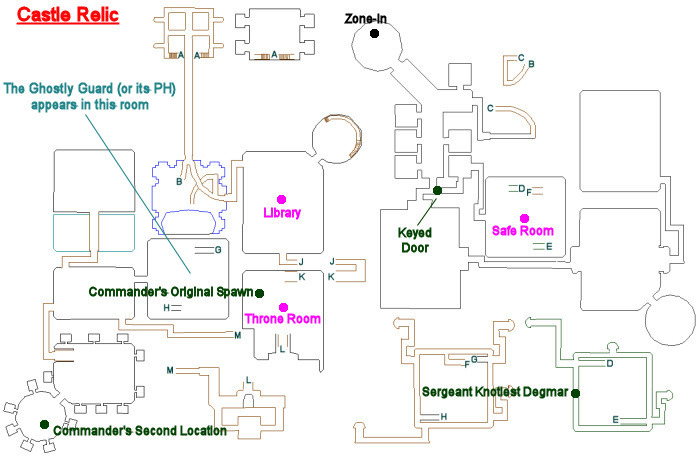 If You Get This Step: Sergeant Knotlest Degmar is found on the walkway overlooking the first floor of the 'safe room'. She hits for a max ~29,000. Loot "Doll of Tunare" from her corpse. NOTE: Pathing is awkward here, and she may drop to the floor below. With this in mind, you may want to clear guards on the walkway AND below her. Task Window Says: Bring the relic back to Priestess Gli'helin. If You Get This Step: Turn-in for task completion. The priestess hugs the doll to herself, and tears fall from her eyes. Priestess Glihelin casts a wordless spell on you. Your awareness fades as you fall asleep. You have entered Degmar, the Lost Castle. 180 Pieces of Eight (currency) at level 102. 3 boxing: Chanter pet and Bst pet followed him as soon as he ran, died; chanter and bst then got summoned, died, immediately thereafter. So, if you are a pet class, back your pets away and hold as soon as (or just before) he runs. What killed the pets? The Commander? I just completed this in 39 minutes, with 5 hours and 21 minutes remaining in the mission, but upon completion it shows, "You have received a reply timer for 'Castle Relic': 2 hours 21 minutes remaining. Hide didn't work, neither did sneak. and also even though I was able to get mission on char with faction. Groupies couldn't zone in. I even completed mission moloing on Enc with a cleric merc, and group didn't receive credit so I wasted a bit of time doing it. --- DPS him to 20% to update. Actually, it should read 25%. Was unable to split the last 3 remaining to kill the commander, we could not get mez to stick with 105 chanter, Tank War kept getting killed. This is ridiculous in my opinion in its difficulty level without raid gear. All three came no matter which way we pulled. we tried Harmonious arrow and the one can be called, but always 3 came. We're told this heroic adventure is NOT required for TDS progression but it IS required to access the solo task Crying for the Dead which IS required for progression so this is a distinction without a difference, in my mind. In short, ya gotta do it! Even worse you need faction even to get this "optional" mission. So that requires doing at least 2 instances of the tasks Castle Raid and Castle Crasher. So for an adventure "not required for progression", you're going to spend some time "not progressing!" This is not a trivial mission, especially for multi-boxers. Fortunately the instanced zone spawns more thinly that the regular version but several rooms required for mission steps spawn pretty thickly. Some of the dorf guardians see thru all invis but it's still not that hard to get around, Aggro range is very small. The two required boss fights are challenging but not all that difficult. My toons have over 100k mana so they all lasted the whole fight with mana to spare. A decent tank is useful, particularly as the Commander and Sergeant hit for as high as 28k and fast. Most of the dorfs can't be snared or calmed. They're immune to snare and too high for the 101-102 calm spells I had access to. The Commander came with at least 2 adds no matter what I did and these adds were red to my 102 enchanter, so her mez spells got resisted a lot. Corpse runs followed. I was starting to think I'd have to level up a bit before re-trying this mission. But fortunately on one bad pull, one of the adds got fouled up in the cell we had set up in and was unable to "reset" to his original spawn point near the Commander. This eliminated one add and we were able to split the Commander from the other add by multiple tag-and-evac (or CoHero) attempts. The moral of the story: Despair not, where there is a will there's a way! Note that if you get librarians they are enchanters and will frequently mez and slow your tank. Might be good to have at least a decent pet as backup tank. No chest spawned and I found no collectibles during the instance. Two did drop from guards: Stick Ring and Depleted Poison Vial. I believe the zone locks at the same time the task locks(idk if this is common or not). Died at 2nd Commander Alast Degmar fight was solo at the time so had to zone out to rez tried to come back in and was told the way is blocked. perhaps you would be able to enter if there was a reason to come here. Again not sure this is common as due to i dont run many HA's. I got a sub-task that asked me to dance with the revelers. To do this, go onto the dance floor with the revelers and spin around/run around a bit until you get an update. I also got a sub-task that asked me to collect 5 fancy red apples, or fancy green apples, etc. This is food that is collected from the tables in the same room as the revelers.You MUST do the dance update first or they will attack you. If you die or evac you will still show the dance step as having been completed but you must dance again before grabbing food or they will aggro. When you get the emote that says that they have raised a glass to celebrate with you then you are free to get the food. Also, the food is edible so either get a few extra so you don't eat it or place it in your inventory below your regular food. Many if not most of the Degmar guardians see invis and some see through SoS as well. Apparently you also need faction to be able to participate in the mission as well. I was able to request yet group member couldn't get in. Priestess kept telling him he needed to prove himself. As soon as we ran Castle Raid and Crasher for the faction hits, he was able to zone in. Greyvvolf performs a FATAL BOW SHOT. Greyvvolf's target was hit by non-melee for 1343953 points of damage. You can also use the campfire to get in. Campfire, hide & sneak can also get you in. I had the same problem, she told me I needed to prove myself. However I'm a monk and I was able to stand behind her, activate my sneak ability (which grants indifferent faction), and then say "adventure" after which she offered me the task. "Ghostly Guard" (or its PH "a Degmar guard") spawns in the armory after the seventh step is completed. PH is actually "a haunted Degmar guardian"
Both the Commander and the Sergeant are quite tough if you have low dps. Their max hits are higher than listed and were parsed at equal difficulty.